"Using feedback and acceleration for high quality deliveries". Although agile practices and the continuous delivery paradigm have been around for some time now, many organizations are still unable to reap the benefits of putting new features into production whenever they want. One reason is the precious time it takes to identify whether the new features are the right features: this kind of quality feedback is simply late or absent. This whitepaper focuses on feedback concepts: when organizations speed up software development, they must also develop features in the right direction. Introducing proper feedback mechanisms is the only way to ensure this. 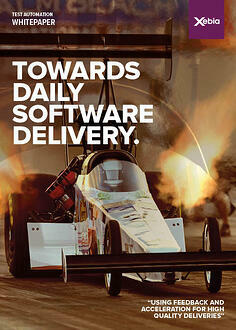 The right combination of feedback and acceleration can help organizations deliver software daily.